Vigil Games Lead Combat Designer Ben Cureton and the rest of the Vigil staff cleaned out the office today, after Vigil was left untouched at THQ's auction. Vigil was shuttered, and as per THQ's letter to employees, everyone working there was laid off. In a post on NeoGAF, Cureton compared the scene in the office to a silent warzone. "The walls look bare," he wrote. "It's quiet. The seats are empty." Vigil Games, the studio behind Darksiders 2, was working on something calledCrawler, a project we first heard about in THQ's December bankruptcy filing. After two months working on Crawler, Cureton was convinced that it would blow people's minds. "I knew, without a shadow of the doubt, that the project we were working on (Codenamed: Crawler) was going to blow people away. In fact, it did blow people away. We did, in two months, what many companies haven't done in a year. The pride of knowing that no one was doing anything like us was so satisfying, it kept us coming to work and giving 100 percent every single day, even through the dark times." Today was one of those dark times. Cureton was taken aback when he didn't find Vigil's name on the list of purchased properties. "Maybe you can imagine what it feels like when you read the list of who bought what only to discover your name is not on the list," he said. "Why? Did we do something wrong? Were we not good enough? Were we not worth 'anything?' Imagine that." 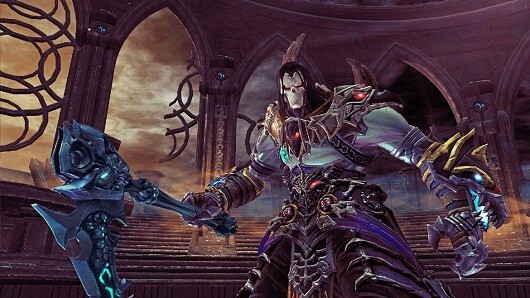 In the end, Cureton thanked fans of the Darksiders series and promised to continue making games, having already worked in the industry 20 years. "In closing, I can only say thank you to the fans of Vigil games," Cureton said. "Your support means more than you can imagine. Your feedback (both positive and negative) gave us long-lasting insight that we will all take with us, wherever we may go. You are the reason we made Darksiders 1 and 2... and you are the reason we will continue to make games.